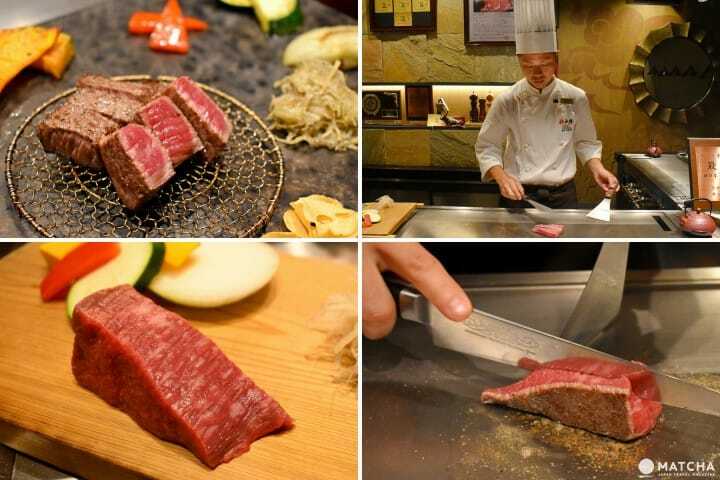 If you're visiting Kobe, how about trying a cut of the famous certified first-class Kobe beef? At Kobe Tanryu in Sannomiya, you can have a real Kobe beef lunch for a reasonable price or try the highest-grade cuts for a once-in-a-lifetime experience! What Exactly is Kobe Beef? If you come to Kobe, you’ll want to try Kobe beef! Known all over the world as a high-class brand of beef, it is definitely a representative beef brand of Japan. Kobe beef is a special kind of meat from the Tajima cattle in the Hyogo Prefecture, which has been certified by the Kobe Beef Marketing & Distribution Promotion Association. This certification is extremely strict. Among other conditions, the cow must have been raised by an authorized operator in Hyogo Prefecture from a lineage that has been passed down across three generations. Only grade-A or grade-B quality meat can qualify as Kobe beef. The Kobe beef brand name is highly protected and taken very serious which is why it is usually rather expensive. A Kobe beef steak can cost from 10,000 to 20,000 yen. Some can even cost over 30,000 yen. In this article, we will take a look at the Kobe beef grilling experience at Tanryu, a Kobe beef specialty restaurant located in Sannomiya (central Kobe) operated by the Kissho Group. Here you can enjoy high-grade Kobe beef at a reasonable price and enjoy a real Kobe experience. Tanryu - Sizzling Kobe Beef Prepared Right in Front of You! Tanryu is located in a building in central Sannomiya. The entrance is located towards the back of the building. When you open the door you will enter a calm and elegant atmosphere. The seats are arranged around the counter which seats up to eight people. The spacious grill is right in front of you once you sit down at the counter. This way you can see your steak being prepared and grilled right before your eyes. Our chef on this day was Mr. Miyashita, who is working as a chef for over a decade. Tanryu in Sannomiya regularly buys a whole cow which has been awarded the highest mark of excellence at one of the fifty Kobe cattle exhibitions held each year. This way they secure top-quality beef to serve to their customers. When we visited, we ordered the akami (red meat) lunch set for 2,500 yen (plus tax). A gleaming block of red meat was unveiled before our eyes. The cut was taken from the cow’s inner thigh, the least fatty part of the cow. The low fat content makes it a rather healthy choice and lets you savor the rich meat taste to the fullest. You will be asked how you want your beef to be cooked. It’s recommended that you choose medium-rare, as you’ll be able to taste the meat’s flavors in a well-balanced manner. First, the chef will lightly season the meat with salt and pepper. When it is moved to the hot grill, you will hear the pleasant sizzle of the cooking meat. The aroma will drift toward your seat giving you a preview of what you are about to taste very soon. The surface of the beef will be grilled on medium-high heat to seal in the flavor. Once the meat is browned on both sides, the chef slices it in half. The well-browned exterior forms a vivid contrast to the red juicy meat in middle. The chef browns the meat on one more side, then lets it slowly cook on the residual heat. A savory crust forms on the outside, while the inside allows just enough moisture to escape to seal in the meat's flavor. When he cuts into it, a cross-section of beautifully cooked medium-rare beef will appear! Lastly, the chef will grill fresh vegetables using the fat from the Kobe beef to complete the meal! A generous helping of colorful grilled vegetables surrounds the medium-rare Kobe beef. The meat is served cut into bite-size pieces and kept warm on the grill, so you can enjoy your beef hot off the grill with every bite. The row of seasonings, starting from the left, consists of meat miso, garlic, Himalayan rock salt and wasabi. The meat miso is made using Kobe beef as well. Saucers with soy sauce and ponzu for dipping are also provided. The chef, Mr. Miyashita, told us to take our first bite without seasoning it, to experience the genuine sweetness and savoriness of Kobe beef cut into just the right thickness. As we chewed, we could clearly taste the juiciness and savory flavor sealed within the meat. Akami is a very lean cut, so the delicious taste of the juicy meat filled our mouths as we continued to chew. Let’s try a light topping of wasabi and garlic. Soy sauce-marinated wasabi leaves are mixed into the wasabi. This lessens the heat, making it a good complement to the beef. After the appetite-inducing aroma of garlic fills the air you can feel the refreshing spiciness of the wasabi in your mouth. This is just one of the recommended combinations. Feel free to eat the beef with your preferred toppings to see how it can change the flavor. After you tasted the Kobe beef, you might want to have some rice. The rice is organic, and cooked in an earthenware pot. This process brings out the natural sweetness of the rice, accentuating each grain. You can eat the rice by itself but if you top it with the Kobe beef meat miso you can fully enjoy best of both flavors. The lunch set also comes with a salad, seasoned with black sesame dressing and yuzu citrus mayonnaise. The miso soup included in this set contains Kobe beef tendon and seasonal vegetables. You can use it to neutralize the taste in your mouth between each bite of meat. Today we ordered the 80-gram Kobe beef lunch set. A lot of people will order the 120-gram set, but honestly, we were very satisfied with the 80-gram set. Choose whichever size suits you best. There are English and Chinese menus available for Tanryu. The most popular item on the normal menu is the sirloin steak on the upper-left in this picture! The 120-gram serving (12,800 yen plus tax) is not cheap by any means. However, if you come to Kobe, it might be worth it to commemorate your visit with the essence of Kobe beef. The staff at Tanryu can speak English. There is also a nearby concierge desk with foreign staff who can speak English, Chinese, Korean and Nepalese. Tanryu is operated by the Kissho Group, which owns about thirty Kobe beef restaurants in the Motomachi and Sannomiya area. You can ask the staff at the concierge desk for recommendations concerning restaurants serving Kobe beef belonging to the Kissho Group. If you’re coming to Kobe, make sure to try Kobe beef. Order an affordable lunch set, or try the highest-class cut for a once-in-a-lifetime experience. Either way, a first-rate Wagyu (Japanese high-grade cow) beef experience is waiting for you! Savor Kobe Beef At Misono, The Originators Of Teppanyaki!